At Cennox, we believe that our reliable solutions will enhance operations for the branches of today & tomorrow. Our 'branch of the future' designs are slick, stylish & functional, creating an altogether immersive customer journey. We are introducing ‘machines of the future’ which fall in line with ‘branch transformation solutions’. They will perform many tasks currently performed by retail banking staff. Deploying more of these machines will reduce the mundane services currently performed by the staff, leaving them more time to engage with customers over more complex banking needs and be able to offer the personal touch. This is an exciting time for Cennox & our customers. 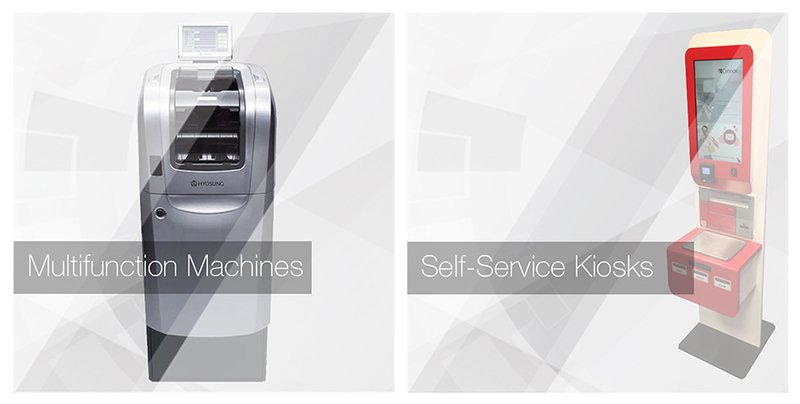 The scope of services & solutions that we offer will deliver a truly new approach to Self Service. Cennox is an established partner of Diebold Nixdorf, with exclusive rights to sell and maintain Opteva and Diebold series equipment in the UK and Ireland. As a full multi-vendor provider, Cennox has signed a UK & Ireland distribution and full service partnership agreement with Hyosung. As well as Diebold & Hyosung, we are also progressing distribution and service agreements with Keba, Banking Automation, & Integrex. In addition, Cennox is also delivering other refurbished machine types including NCR, Triton and Wincor. These machines are refurbished to an ‘as new’ condition and offered to the market at very attractive prices. Enables cash load/unload between external transit cassette and inner recycling cassette. Cennox provide solutions for leading brands in the Banking, Retail, Transport & Leisure industries. With headquarters in the UK, USA & Europe, Cennox delivers nationwide solutions to support our clients. Previous CENNOX ARE LISTED IN THE FASTEST GROWING BUSINESS TRACK 200 FOR THE FOURTH YEAR RUNNING.